The cast of ‘Feet Don’t Fail Me Now!’ Photo provided by Rhythmic Circus. Music and Dance combine in this impossibly high energy ensemble of tap, big band, rap and beatboxing. The Performances for Young Audiences brings Feet Don’t Fail Me Now, titled to remind us to never give up on our dreams, plays at the Kennedy Center, May 15-17th. Outrageous costuming, and a combination of solo dance numbers and unison sets Ricci Milan, Nick Bowman, Kaleena Miller, Galen Higgins uniquely dance their way from our eyes and ears into our hearts. 3 men and one woman, a different configuration than our normal dance companies, there was not the paired dancing we are used to, it was either individual or unison for this group. Tap dancing originated in the mid 1800’s becoming popular during the Vaudeville years, Bill “Bojangles” Robinson, Sammy Davis Jr., and Greg Hines are several examples of stars known mostly for their rhythmic jazz instruments, their shoes! 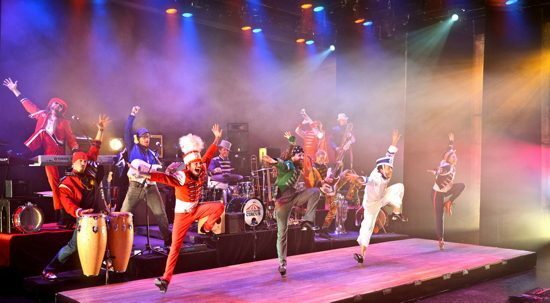 Part Blue Man Group, Stomp and Riverdance combined, this young cast will have you out of your seat and cha cha’ing home to dust those tap shoes off. What makes these entertainers a must see for all that love dance, is that they are as talented to watch as they are inspirational to admire. …Ricci Milan, Nick Bowman, Kaleena Miller, Galen Higgins uniquely dance their way from our eyes and ears into our hearts. For 60 solid minutes 5 dancers and a band of 7 expend energy like a hummingbird with grace, stamina and joy! These “home grown hoofers” and musicians have been performing together since 2008. They are on a one year International Tour that was, pardon the pun, kicked off this week at the Kennedy Center! Most are originally from Minnesota, all of the dancers are professional having worked in choreography and performance before melding their talents to create this percussive dance extravaganza. And it is clear that they positively love to dance. I was gasping for air when they asked for the audience to do a little participation game. The show seems to want to inspire the audience to simply do something. You can dance anytime with anyone with few props to keep movement, energy and dance into everyone’s lives. With nothing but a metal chair, the men of the group come together smashing, crashing and balancing, tapping and delighting us. As the mothers in the audience cringe at the thought of their children smashing the furniture to a groovy beat, the message is there, you need not have expensive props, shoes or training. Anyone can dance to varying degrees, and anyone who does will be happier because of it. The band too is the epitome of cool. Lead singer, Alex Rossi looking as unflappable as the rock legend Robert Daltrey of many years ago. Also jamming in the band, Dan Ristroman (bass/vocals), Peter Vircks (saxophones), Aaron Wiener (trumpet), Cornell Blanchard (keys/vocals), Patrick Nelson (drums/tuba/vocals). Combining music to technology Aaron “Heatbox” Heaton, astounds us with what vocal Percussionists can do. The combination and skill to work mixing the electronic sound system with his feet while producing amazing sounds with his voice is astounding. He explains that his unique sound is much like a “funky a’cappella group from outer space.” Yes, that was exactly what I was thinking. In the last part of the show, each of the dancers comes to wage battle upon Mr. Heaton, challenging his vocal sound effects to their dancing choreographed like a fencing match! Touring with the troupe is sound system engineer Miles Hanson has made it his life long goal to, “make a single pair of tap shoes louder than a 7 piece funk band.” Lighting designer Mark Ruark has his work cut out for him learning a different set of lights with each city. Costuming whether it was hiking boots with taps or the completely Sargent Peppers outfits were fitting with whatever dance number they were paired with. Running Time: 60 minute program, no intermission. Feet Don’t Fail Me Now! at Performances for Young Audiences at The Kennedy Center ended May 17, 2015, click here for more information about Feet Don’t Fail Me Now! and click here for more information about what is playing at The Kennedy Center for Performing Arts.